How long after the female flower blooms would you expect a mature fruit? I had one six days ago and pollinated it myself. Another one must have popped open three days ago, but I was away for two days, and the flowering was done by the time I got home. The fruits are both the same size... pretty small. About the length of my index finger. The plant otherwise looks good and healthy. Our weather has been great - hot days (high 70s/low 80s), cooler nights (60s), only a bit of humidity, and I think I've watered pretty evenly. Not much rain the last two weeks. It depends on how vigorous and healthy the plant is, and yes how many fruit it is making, and weather factors too. I have had them mature to good size in 2 days from pollination, and as slow as a week, and up to 4 mature ones at once on a plant. Feel free to eat them whenever you want, the plant will keep making more if it is healthy. Excellent, good to know, thanks. Maybe I'll give them another day or two, if fussy SO isn't in the mood for marinated grilled baby zucchini. If these are your first it would not be uncommon for the first few to develop end rot. It happens and doesn't mean there is anything wrong with your plant. Just clip them off and others will quickly take their place. In fact, you will soon be inundated with them and begin to wonder what you are going to do with them all. With 2 mounds I harvest a dozen in a 3 day period and they are going strong. So far (crossing my fingers) I haven't seen any signs of vine borers. Also be aware that - depending on the variety - if you pick them at an uber-baby stage they may either have no flavor at all or even be on the bitter side. 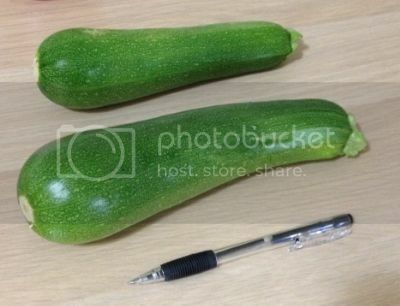 Yes - you do want to pick summer squashes on the young side, but unless you're growing a type that's specifically meant to be picked at "index-finger baby vegetable" size, you may not enjoy it. Belated thanks. I ended up picking them a few days later. They were still pretty small, but they were good. The texture was a bit more dense/less watery than normal zuke, but the flavour was great. I have a pair of bigger ones for today. The pen is for scale. The next one on the plant is small, but looks like it has BER. I guess I'll just hack it off. Not sure what would have caused that.